THERE IS SOMETHING FUNNY ABOUT PODCAST 120!!!! Sup...it's time for your favorite part of the week, the Mega64 podcast!!! In this podcast, we talked about how much we enjoy youtube comments of all shapes and sizes. Plus, the making of our new videos, "Anything Can Happen on Halloween!" and for IGN "Modern Warfare 2! "Click here for the sounds! We also would like to take the time to show you guys a clip from a DVD that was shipped out in a Russian Magazine! 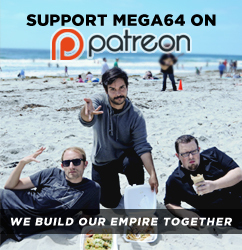 Click here to see "MEGA 64: ??????????!! Come back real soon! Good bye! !